In this occasional series, we introduce you to trainers with unique perspectives or workout philosophies, or who have just plain interesting stories. Consult your doctor before starting any new training plan. Anna Kaiser, owner of the New York City-based boutique workout chain AKT In Motion, sounds larger than life over the phone. In person, the 35-year-old who stands 5 feet 3 inches is no different. Channeling a bit of that Elle Woods spunkiness, Kaiser has built her business with solid credentials: her bio boasts http://aktinmotion.com/crews/ a professional dance career spanning 25 years mixed with studies in sports medicine. Kaiser began teaching ballet, body conditioning, flexibility and dance cardio in 2003 at New York City at Reebok Sports Club NY and The Sports Club/LA. Training, according to Kaiser: “It’s important to work out functionally — in a way that supports your lifestyle. Most people are never going to lift 80 pounds overhead so why would you train like that? While Kaiser was out acquiring teaching certifications and digging deeper into the fitness scene, she found, like many workout warriors, she was hauling herself all over the city to capture everything she wanted in a class. She says the goal of AKT In Motion is to create a powerful combination of elements that are trend-resistant and personal. 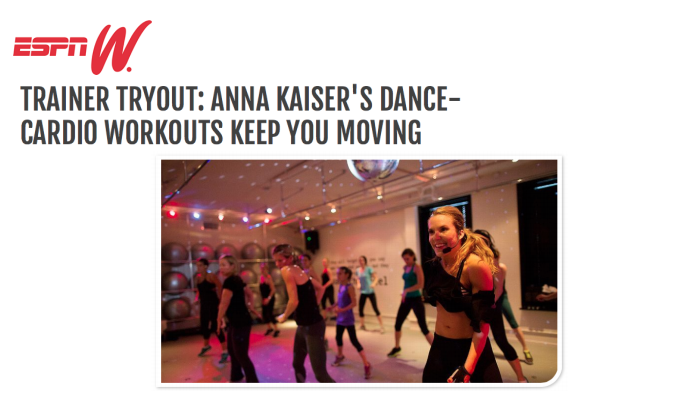 A dance-based interval class at Kaiser’s studio starts with a warm-up, but be prepared for a club vibe to kick in — some classes even have a disco ball spinning — as the entire class is set to LOUD music. The instructor does everything with you so there’s added motivation and little chance you won’t be able to follow along. I took a class to check it out and to see exactly how she keeps her celebrity clients like Shakira and Kelly Ripa in such rockin’ shape. It was a Wednesday at 12:30 p.m., the room was packed with 16 folks plus our instructor, Jessica Castro, for Happy Hour, a booty-shaking, 60-minute class and that is the basis of Kaiser’s new DVD which features an intro by another of her personal clients, Sarah Jessica Parker. Castro, a former Knicks City Dancer who has toured with Janet Jackson, Jennifer Lopez and Rihanna, had us doing grapevines and plank push-ups and high-stepping. She moved effortlessly around the room to encourage, assist and correct form where needed. I laughed as I tried to keep up as the combinations progressed, but thoroughly enjoyed the motivating, music-video-style choreography. The class is built on progressive dance sequences that even novices can pick up without too much of a struggle. Kaiser also offers private training, including an eight-week “transformation program” — that comes with, among other things, a “fitness concierge” who creates an individualized program — and incorporates nutrition counseling sessions. Kaiser shared three core moves used in her personal training sessions that can be scaled to home use. She recommends 10 reps of each. You can alter this movement as your strength allows. Start with half-plank and then graduate to full-plank for a tougher routine. *Set up in a full-plank position. *Lower your knees to the floor *Straighten your knees up back up. *Press your arms back up, extending your body back into a plank. Make sure your hips are parallel to the floor as you reach out so you’re not compensating by putting the weight to either side. Use a dishtowel or a glider; or a paper plate if you’re doing it on a carpet. *Start in a plank, hands shoulder-width apart. *Keeping the right arm straight, glide it out as far in front of you as you can while bending the left arm. *Glide the right arm back in. This can be done with weights or without. If you’re using a weight, hold a 10-pound weight or medicine ball between your hands, with the weight about 4 inches off the ground. *Lie flat on your back with your arms above your head and your toes pointed. *Tuck your chin to your chest, keep your upper arms by your head, and roll up through each vertebrae. *As you’re rolling up, take your right leg up off the floor, bringing it into your chest. *Continue to bend your knee toward your right shoulder as you twist toward the right leg at the end. *Reverse by untwisting and rolling all the way down.